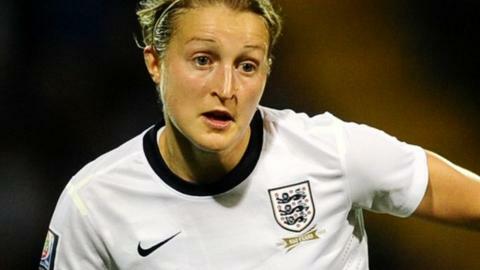 Notts County Ladies striker Ellen White is likely to miss the rest of the Women's Super League season after suffering a serious knee injury. White, 24, is yet to play a competitive match for the Magpies, having damaged a cruciate ligament during a pre-season friendly against Durham. The England international only joined Notts in December from Arsenal on a three-year deal. "It's bad news for us," Magpies manager Rick Passmoor told the club website. "It's a blow for us, and for Ellen, but we'll be working hard to get Ellen back to fitness." In White's absence, Jess Clarke has fired the Meadow Lane club to the top of the table, scoring all of the Magpies' goals in their opening two league games. "Jess Clarke has started really well for us playing up front, she's got three goals already," said Passmoor. The re-branded Magpies have been hit hard by injuries since leaving Lincoln for Meadow Lane this season, with England defender Rachel Unitt and New Zealand internationals Katie Hoyle and Anna Green also sidelined.